According to Bing, Mae West was quoted as saying "Too much of a good thing can be wonderful." That sounds about right to me. I just came back from an incredible trip to Eastern Europe where I visited a number of copper and gold mines going back to Bronze Age times and later mined by the Romans. But first I want to talk about a subject near and dear to my heart. As longtime readers will remember, I have been warning about the dangers of derivatives for many years. It's pretty simple; derivatives are financial bets on almost anything backed by little or no collateral. With a world economy of about $60 trillion, we have derivatives of ten times that much, about $600 trillion. That's up $500 trillion since when I first started warning of their dangers in 2002. There is no way there is any logical or business purpose for such a surfeit of financial bets. They don't make any business sense. That's about $100,000 worth of derivatives for every man, woman and tiny baby on earth. Therefore, they must be fraud. There are  49 million mortgages in the US, about 40% are underwater. Now we are learning that the institution trying to foreclose those mortgages has been engaged in massive fraud. It's entirely possible that one day soon a judge will issue an order halting all the foreclosures of all properties that are backing derivatives. Basically when you slice and dice a mortgage, it no longer belongs to anyone if it belongs to everyone. The day that happens, the banking system in the US is going to be forced into doing what they should have done a year ago. They will have to write off all the bad debt they are carrying. And the system will come to a screeching halt. I've told my readers for years to prepare. I've told my readers to own some physical metals. I've told my readers to invest in production stories. Do it now or accept a permanent state of poverty. The activities of the US government are going to destroy the US dollar and turn the country into a third world nation. Your grandchildren will still be paying off the money being stolen daily by Goldman Sachs and the rest of the thieves. Letter writers who use a subscription model are by nature forced to tell people what they want to hear. If someone doesn't tell you what you want to hear, you don't subscribe. (Or vote for them. An honest politician would never be elected.) We don't use that model and as such I can pretty much tell people what they need to know, not what they want to hear. I'm not as popular as those who engage your fantasies but my readers are better off. The company I saw last in Eastern Europe has more world-class projects than my tiny little pea-brain can cope with. I told them they have to start spinning off projects so investors have a clear model to invest in. When a company has 5 world-class projects, any company, they get valued as if they have two. Investors simply cannot cope with all the information about all the projects. I can't and you can't. But if they spin off clearly related projects into companies of their own, you and I can make reasonable investment decisions. EurOmax Resources (EOX-V) has a franchise in Eastern Europe. They started in Bulgaria seven years ago and expanded into Macedonia and Serbia. These are not easy areas to navigate in. Communism existed for 10 years after it collapsed in the USSR. Only now are these countries coming out of the dark ages. We drove around the three countries for 5 days. Communism doesn't work and it was pretty obvious. Infrastructure and the ability to navigate through bureaucratic BS is difficult at best in the Balkans. While I saw several world-class projects, don't look for a staking war anytime soon. It's the kind of place that you have to spend years accomplishing little or nothing to be able to accomplish anything ever. You have to earn your spurs again and again. EurOmax has a franchise and it's a valuable franchise. As Anthony Patriarco, a Director of EurOmax and major investor, explained to me, EurOmax wants to be the dominant mining company in the Balkans. They are that now, they are the only junior exploring in the Balkans. They have picked up a stable of about 9 projects often based on historical mining going back to Bronze Age and Roman mining days. I've been to old mining camps in Mexico and Bolivia dating back to the 16th Century and there was something fascinating looking at workings dating back thousands of years. EurOmax is taking old data from the Communist regimes and entering it into modern software programs. They then take that data and add modern exploration techniques before drilling. When they have advanced each project to the desired stage, they plan on spinning the project into a new company or doing a joint venture with a major mining company. Their financial strategy is to put an existing 235,000-ounce gold JORC resource at Breznik in Bulgaria into production and shipping the ore to a mill located about 80 km away. They will use that cash flow to advance the other major exploration projects. The target at Breznik is 900,000 tonnes at 8.2 g/t Au and 15 g/t Ag. I fully approve of going into production on a small scale to ease cash flow even though the company is very well cashed up at $12 million in the bank. Breznik is currently being drilled. Results should be out within a few weeks. CEO and 43-110 QP John Menzies is targeting the boiling zone of an epithermal system. Grade and tonnage could increase significantly. All companies have issues and EurOmax's is simple. They have far too many quality projects for investors to come to grips with. So I have deliberately dumbed down this report in the faint hopes someone out there reading it will actually understand the magnitude of EurOmax's potential. I am ignoring what would be world-class projects for any junior in North or South America. I'm almost tempted to suggest you ignore their web site, it has far too much information for me to understand and I spent a week driving around the Balkans looking at 6 different projects. At the end of the tour I couldn't remember the names of all the great projects and could barely remember my own. But there were a couple that sort of reached out and poked me in the eye. I won't forget them. The most mind-blowing was their Ilovitza deposit in Macedonia. It is gold-rich, copper porphyry with some moly credits. EurOmax has a 43-101 inferred resource of 303 million tons containing 1.6 billion pounds of copper and a whopping 2.9 million ounces of gold and 34.6 million pounds of moly. If you go to Kitco's site and feed in the numbers of .23% copper and .31 grams gold, you come up with a rock value of $24.70 as of today. With 303 tonnes of a 43-101 resource, that works out to a gross metal value of about $7.5 billion. When you try to figure out what a company is worth, it helps to have a number for the gross metal value of a given project. Naturally not all projects are viable. You could have a billion tonnes of .001 g/t gold worth $.03 a tonne and clearly it's worthless as anything other than rock. But $25 rock is economic. The Ilovitza project is perfectly located for an open pit heap leach operation. With economic grades, depending on the whims of investors, projects are worth anything from 1% of gross metal value to 10% depending on how much whacky weed investors have been smoking. Right now a gold rich copper porphyry should be worth 1-2% of gross metal value. That's $75-$150 million. As of today, EurOmax has an enterprise value of about $36 million after you deduct the cash on hand of $12 million. That makes them pretty cheap if all they were was a one-trick pony. To make the deal even sweeter, EurOmax conducted IP over the area and discovered an untested anomaly that may be the plumbing of the system. They plan on starting a 1400-meter drill program shortly to drill 2 700-meter holes into the core of the anomaly. The existing resource would justify a mine, adding to it would strengthen EurOmax's position when doing a deal with a major. Look for results in about 8 weeks. Within Serbia EurOmax has another potential world-class project called Ceovishte. The project has a 6km zone of mineralization. 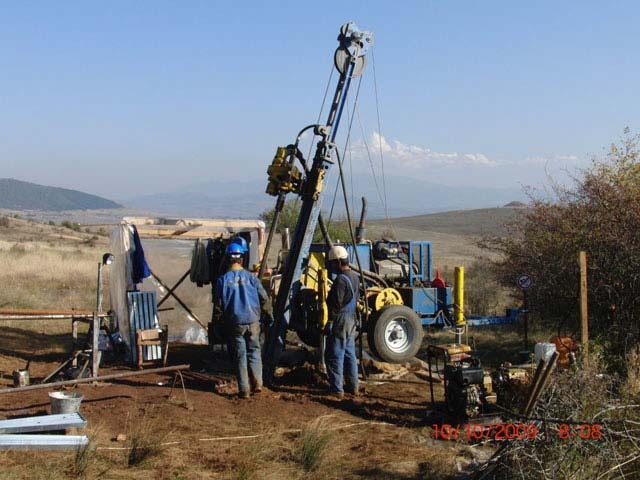 Drilling in 2008 intercepted intervals of up to 12.4 meters of 1.5% copper, 1.6 g/t gold and 62 g/t silver. For 2009 EurOmax has begun a 13 square km geophysical program and a 2,500-meter drill program to test two large gold bearing breccia targets. The South Breccia measures 1200 meters by 400 meters. Geophysics indicated a wide body at depth extending 500 meters deep. In Bronze Age and Roman times the breccia was mined with both underground workings and open pits up to 300 meters long and 70 meters wide. Samples of the float and outcropping shows grades up to 4.1 g/t au and 124 g/t ag and .4% copper. What EurOmax calls the North Breccia is 1600 meters long and 300 meters wide. Geophysics reveals a subsurface body with a strong I/P response consistent with the surface outcrops of the breccia and open pits. This subsurface body extends to 700 meters in depth. EurOmax has two drill rigs on the project and the first results should be out shortly. In Macedonia we visited a giant copper project EurOmax calls the Kazandol Copper project. There is surface copper oxidation extending over a five-kilometer zone. Surface trenching shows results of up to .44% copper over 175 meters. The entire area is pockmarked with the remains of open pit mining over thousands of years. 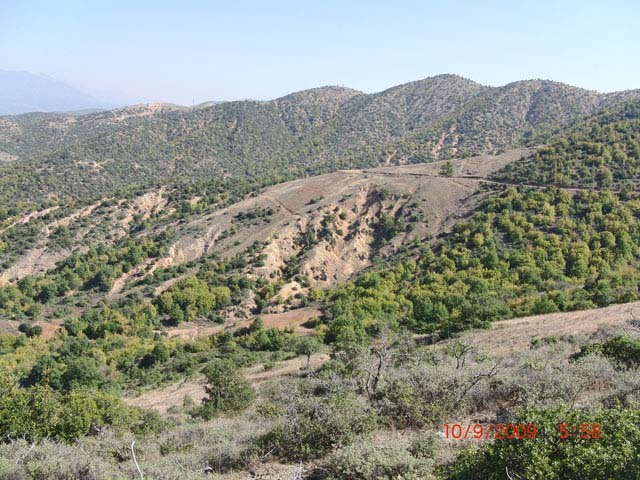 Preliminary drilling in 2007 revealed a 50-meter thick band of copper oxide that appears to be part of a thrust fault. Hole 803 showed 47 meters of .59% copper oxide. For the 2009 program the first phase will include trenching and later a RC drill program. EurOmax intends to put the Kazandol project into production to make copper sulfate using a low cost SX-EW process (Solvent Extraction Electrowinning) for sale within the region and in Europe. I must admit I was totally knocked over by my weeklong visit to 6 of EurOmax's main projects. The least project we saw had incredible potential. The best of the lot would support a share price three times higher than today. When EurOmax first contacted me, the story intrigued me to the point I picked up the phone and bought shares. Everything I saw in the Balkans backed up my original feeling. This is a world-class company with an enormously valuable franchise within the Balkans. They have other projects on tap and will be adding to the stable. I want to encourage them again to spin off projects into individual companies as soon as possible. The range of projects is simply too much to come to grips with. Management depth and experience is brilliant. The connection to local politics is excellent and that's always important. The projects have world-class potential. The company is well cashed up and has plans for creating internal cash flow in about 14 months. I think all of the pieces are in place for a mid-tier company. EurOmax is an advertiser. We are shareholders. I like the company a lot. It is confusing and I would encourage potential investors to look at but not memorize the web site. There is too much data to cope with. I would expect a major publicity push to take place with drill results coming out shortly that can be company making. The stock is exceptionally tightly held with 68% of the shares in the hands of insiders, friends, family and management. Teck and Freeport are major shareholders. This stock could be very hard to pick up, there simply isn't much float but it's a long term hold with 10-fold returns possible. As always, we don't share in your profits so take some responsibility for your own actions and do your own due diligence. There are some lovely photos, you can view them - in 'gallery' form - by clicking here.